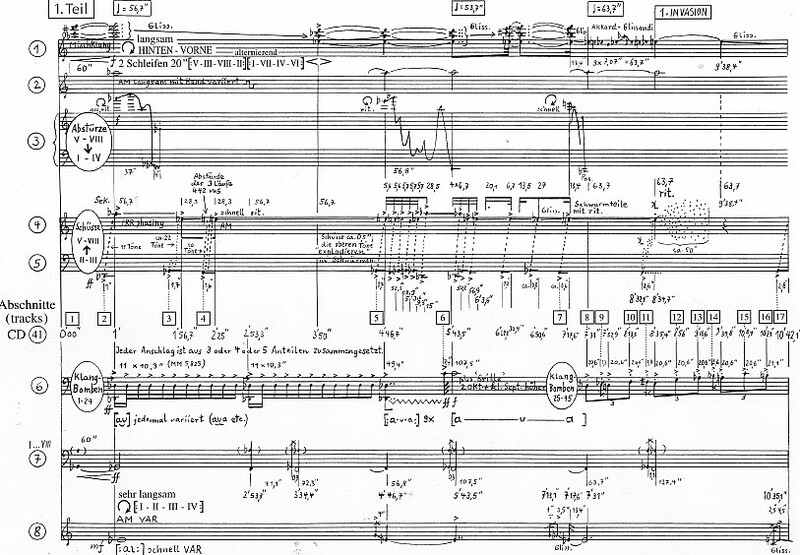 Works » Stockhausen's Electronic Music: Composition or Artifact? One thing I've sometimes wondered about regarding the '90s electronic works (Oktophonie, Weltraum (the tape music from Freitag Aus Licht) - even Mittwoch's Abschied, etc), is if these works are static, unchangeable works on tape (such as the tape works of Pierre Schaeffer, Pierre Henry, Varese, Xenakis, etc...) or if they are compositions which can be recreated by new generations (such as the compositions of Beethoven or Bach). For example, Cage's Fontana Mix is a "tape work", but it has also been newly-generated using Cage's compositional method, which is something like doing a "rendition". As far as I know, Simon Stockhausen was almost entirely responsible for the programming in those '90s pieces, so in effect he "performed" those scores. I guess I would particularly be interested in new renditions of Oktophonie or Cosmic Pulses using 2020 technology. The published scores leave quite alot of leeway for the creation of synth patches. It would also be interesting to hear a new realization of Couples from Friday (Paare vom Freitag). Hearing Stockhausen and Kathinka perform those duets is fantastic - and almost an "intimate" experience, but it would be interesting to hear new versions by a new generation of Stockhausen performers (Michael Leibundgut, for example). Or is this total heresy? Of course any such undertaking would require the approval of Suzee and Kathinka, but it's fun to think about. An interesting question, Ed. Fortuitously, I have been writing about this issue in a broader sense just recently for a journal article I am preparing on the question of 'Werktreue' in Stockhausen's music, including how it applies to his electronic works. I think, in principle, the answer to your question is 'yes' - these works are scores rather than stagnant artefacts and so can (again in principle) be newly realised. The challenge, however, is doing that properly. With the electronic works (indeed with the acoustic works too) there is usually a lot more to them than you might pick up just from the score. There will be heaps of detail that was discussed and worked out in the preparation of the recording, lots noted down in the sketches, lots talked about in the studio. Without knowing this, it can be very hard to know what is and isn't essential to the work - choices about timbres, spatialisation, etc, will often be part of this equation. Some of these questions are arising to an extent (although not to the extent you raise in your post, Ed) with the preparations for Aus LICHT in the Hague where, for example, timbres for synthesiser parts have to be considered: do they replicate what was done in the first performances with Stockhausen, or do they develop new timbres? These are interesting and complex discussions that cannot be sorted out simply or without close connection to those who were involved in the initial realisations. Parts that are not intended to be performed live - such as sound scenes and electronic layers like the ones you mention - don't really need to be redone, but that doesn't meant that they can't be or even that Stockhausen himself would not do them again given access to new technologies (although he didn't really tend to do this with the new technologies that did emerge in his lifetime: note, for example, his comment about performing the electric organ parts of MOMENTE on synthesiser: this was done for the 1998 version of MOMENTE, but Stockhausen said afterwards that he would prefer that it be performed on the original electric organs). So, if we generalise that comment to other works, we may well be left with a position of 'why would you do it at all if the aim is really to just reproduce what is already there?' The example you give of the PAARE from FREITAG aus LICHT is a good illustration of this. Yes, you could redo it, but if retaining the same timbres and vocoder-type vocal sounds is an essential part of the sound you are trying to create, then is there a reason to redo it when it is not intended for live performance anyway? Still, that doesn't mean that it shouldn't be done - but I think it is more than just needing the approval of the Stockhausen Foundation: it would be a matter of actively involving them in the process because that would, I believe, be the only way of knowing what is and isn't important to seek to retain from the original. It could lead to some interesting and rich conversations about what is essential to any particular piece - these are, I believe, really important conversations to be had in any performance of Stockhausen's music, but are conversations that can only be had through meaningful and respectful involvement of those who know the pieces beyond what can be read in the scores and texts. It's worth noting how important this knowledge was to Stockhausen. His paper 'Werktreue' in TEXTE 11 stresses this enormously and gives quite a few examples of people who have gone off and performed his works without knowing the details that had been worked out and talked about so laboriously in the whole composition process and the trial and error that went with it. He was very critical of musicians who thought they knew how to perform the music simply because they had the score and their own knowledge and skill as musicians. He was saying this in relation to non-electronic works such as INORI and GRUPPEN, but we can assume that the issue applies at least as much, and probably even more, to the electronic works, where there is so much detail behind the scenes, as it were. It's also worth remembering that Stockhausen was very adamant that particularly his early electronic works were finished and not to be tampered with. I think he meant this more in terms of not wanting people to pull them apart and develop them in different directions - but, even so, it is a important cautionary word about any interference with them at all. So, in short, I don't think any of Stockhausen's scores are stagnant artefacts. They are living works - but keeping them alive is far from a straightforward job of following an instruction manual or of thinking we can just go ahead and redress them in today's clothes. Insofar as Stockhausen felt his electronic works were completed, we should be extremely cautious about doing anything with them - but, with caution, and involving the people who shared in their development and early years, it may well be a conversation worth having. Thanks Ian, you bring up some great points I hadn't originally thought of. You're absolutely right, doing a "performance" of a piece is much more than just pecking out the dotheads and stems on a keyboard, it (can) really also involve a passed-down oral tradition integral to the work itself, with many parts of the composer's intention not included in the published score at all. Come to think of it I recall even Beethoven saying that his published scores were littered with errors and he was still making corrections to his scores even into their 2nd and 3rd editions... For works with vocals or instruments it's of course a tradition (in fact a source of legitimacy) when an interpreter learns directly from the line of original interpreters (Thank God for the Stockhausen Courses! Do we even have a similar line of tradition for Beethoven?) - I hadn't thought of applying that same line of logic to the electronic works - or more likely I was resisting, being the trouble-maker that I am. Having said that, the person most appropriate to work with in doing new realizations of those '90s works is Simon, and I have a feeling he wouldn't be very excited to get involved in such an endeavor. So are we relegated to pulling out the same 1/4 tape (or whatever) for the next 100 years? I really hope not. But at least we agree that these electronic works SHOULD have some life beyond '90s Akai/Yamaha synth patches. Regarding the use of organs in Momente, I feel that those are a slightly different case. An organ (electric or not) has a very specific sound and connotation. The DX7 "Brass Pad 2" patch has a much less weighted history (although I could be wrong!). The Couples of Friday are also a "slightly" different situation. First off, I love those tracks and I think Stockhausen and Kathinka's vocal contributions are sublime. However, Stockhausen and Kathinka are not the only vocalists who have the skills to perform that work. So why did Stockhausen choose himself and Kathinka? Is it because their voices are "integral" to the work, or would Stockhausen have also been interested in having this work exist as a "living performance piece"? That is my question. As a listener, I think it would be absolutely fascinating to hear Couples of Friday performed live (very possible with today's technology), perhaps on a bill with the Indianleider. I would go to that! I'm also reminded that Antonio Perez Abellan did a new version of Synthi-Fou... I feel like that piece is in the same wheelhouse as those others works of the period, especially when put in context from a published score point of view. A further question comes to mind: what is the purpose of making the scores to the electronc works available for purchase? Are they only for music analysts and listeners, or can they also be used for performance purposes? Considering the amount of detail Stockhausen puts into many of his scores concerning the nuts and bolts aspects of performance (although I can't recall about the electrinic ones) I feel like maybe this was something he anticipated. Yes, I think your point that there are different issues between the different works is a good one: but I do tend to think that the works that Stockhausen composed for tape, rather than for live performance, should generally be thought of as complete and so not redone - so in some ways I am possibly moving to an even more conservative position than where I started. I just stumbled across another letter from Stockhausen in the TEXTE, where he writes very vehemently against touching his electronic works, although he says this in the context of 'remixing', which is not exactly what you have in mind. But he is at great pains to point out how much time was spent getting them to be exactly as he wanted them (he gives the example of the electronic music from FREITAG, and that that involved two and half years of producing and mixing the 20 channels. So you can see why he would be reticent about people recreating them. As Suzee has said in another context, the trouble is often that people don't know what they don't know. The PAARE example is an interesting one, and probably a good one in terms of the potential risks of trying to do it live. There are so many subtle sounds in there as well - the concrete sounds of the machines and objects, etc, so integrated with the voices and synthesiser. I'm sure it could be done - but you can appreciate the risks of getting it wrong or of missing out on some detail that you just didn't know was important. But despite my reservations, I have often wondered about some of these things myself. I have often fantasised about hearing COSMIC PULSES performed on 24 live synthesisers, or UNSICHTBARE CHÖRE with live singers: but ultimately these are only fantasies. The scores of the electronic works are, as I understand it, mostly created for study purposes and many of them after, rather than before, the realisation of the tape. And, of course, some of them do not have a score at all, or only a very bare score (such as the electronic layer of FREITAG). So I don't think they were created with an intention of being used for recreation of the performance. But it's tempting, of course - and Juan's Verdaguer's work in creating an interactive digital score for GESANG DER JÜNGLINGE is an example of that temptation being met in a really creative and yet still respectful way. Sorry - just one more thought. An interesting case that slightly connects with this whole issue is MITTWOCHS-GRUSS and MICHAELION - a piece that is played as a tape in the GRUSS but then live on synthesiser in MICHAELION. That, however, actually emerged in the reverse order to how it is heard: the work was originally conceptualised as a piece for live synthesiser playing relatively quietly through MICHAELION, and then a four-channel tape of it was made to be played in the foyer during the GRUSS. So it's kind of the opposite order to what you have suggested with, for example, PAARE von FREITAG. But come on, if you heard that Juan, Sean Williams, Antonio or Simon were planning to do a new realization of Oktophonie/Weltraum or Mittwoch's Gruss you'd be excited to hear it! I do want to make one important distinction in my own wishes tho - electronic works pre-1970 (Gesang Der Junglinge, Hymnen, Telemusik) I would never want redone, simply because those were "hand-made" constructs with KS directly "performing" the pieces to tape. I believe for the other works with Simon and Antonio, KS was much less "hands on" with the timbres, and maybe acted more as a "final decider", rather than a "notch it 260k with a q value of 25" kind of guy - but I could very well be wrong...! Anyways, these are all just personal thoughts and wishes, and if Suzee or Kathinka ever come across this conversation maybe they will weigh in, but I'm not really "pushing" to do one of these things myself (my computer still restarts by itself from time to time, and I'm still struggling with iTunes!). Oh yes, I would certainly be excited to hear it! Of course the choices of timbres is just one part of the process, alongside all the other issues of mixing, and balancing, and spatialisation, and dynamics, and things about which I know virtually nothing as far as electronic music is concerned: so I guess it would just be important to at least involve someone in the process who had a first-hand knowledge of what Stockhausen's intentions were on all of those. It would be interesting to hear Antonio's comments on the extent to which, and ways in which, Stockhausen was involved with the timbres for those works in which Antonio was so deeply involved. Of course, he was able to afford a much greater level of creative responsibility to artists who he trusted and who he knew were in artistic sync with him. I, needless to say, would not dare touch any of it. The most i have ever attempted in Stockhausen performance is to play the Michael formula on the theremin, and that was an unmitigated disaster. I believe years ago Antonio did a seminar on how he created his sounds for Stockhausen for the Courses.... Maybe a recording exists in the Archives?